Teaching a beginner at the Atlanta Music Project. Getting started on making a sound! The above quote from Japanese philosopher, calligrapher, and swordsman, Miyamoto Musashi, truly embodies my musical teaching philosophy. The aspiration I hold for each of my students is success. However, the success that each student strives for will be unique to each student. Thus, I teach my students lessons that apply not only to music, but rather the unique skills that command success in any endeavor. Some of these skills are: discipline, hard work, problem solving, and dedication. I teach each of these skills using the trumpet as a vehicle for instruction to teach The Way. Once a student understands The Way, he or she will see it in all things and understand what it takes to be successful in any avenue. I believe that within EVERY person lies the ability to make great music. As a music educator it is essential to locate and foster the growth of this gift. Studying music is a very individual experience and each student will walk a very different path. Therefore, since no two students are identical a different approach will be custom tailored for each student to maximize his/her personal potential. The greatest joy in teaching music is observing a development and transformation in the student that is not only musical, but intellectual and personal as well. Email me at jhbryant1@gmail.com or call me at 828.242.3944 to inquire about getting started. I look forward to working with you! Children that are involved in arts education learn many of the traits that parents wish to instill in their children and heartily demand of their child’s schooling: academic excellence, social and emotional involvement, civic engagement, and equal opportunity. There are myriad studies that speak to the veracity of this claim. It is a well-documented fact that students involved in their community’s arts programs have better math scores, increased cognitive ability and critical thinking skills, as well as heightened verbal skill. These days, young students are often concerned about college entrance and career considerations as early as age 14. The research is clear, if your student is involved in arts education, he or she will have an edge over their peers not enrolled in arts education. Arts education is not just for young students either! Some of the world’s greatest minds such as Albert Einstein, Benjamin Franklin, and Plato were also life-long musicians and spoke to the benefit of music education. Responsibilities include teaching applied trumpet and brass methods. Established the RU Trumpet Ensemble. 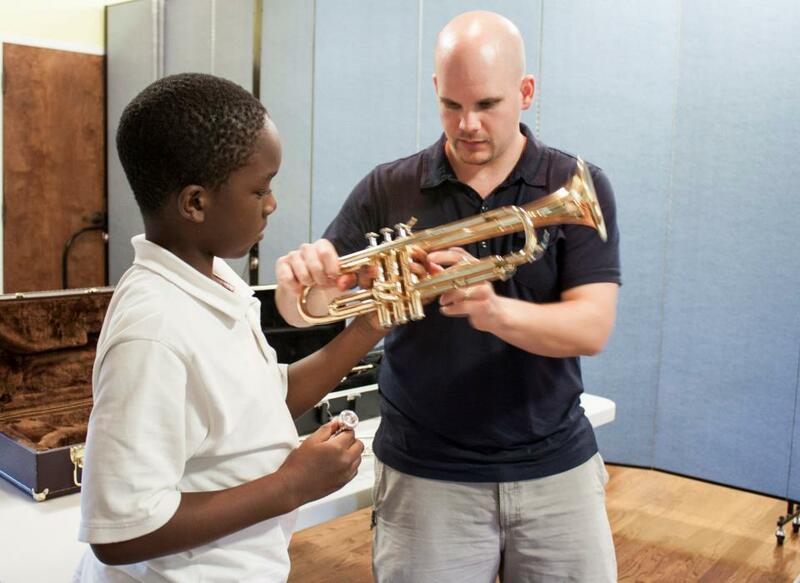 Responsibilities included teaching applied trumpet and horn, teaching aural skills, world music, music appreciation and coaching chamber ensembles. Established the YHC Trumpet Consort and YHC Brass Choir. Initiated Young Harris College Trumpet Summit (Festival and recruiting event highlighting the musical opportunities offered at Young Harris College). Increased studio size 400%. Responsibilities included teaching applied trumpet, coaching chamber music ensembles, and serving as the assistant conductor of the NGU brass choir. Established the NGU trumpet ensemble. 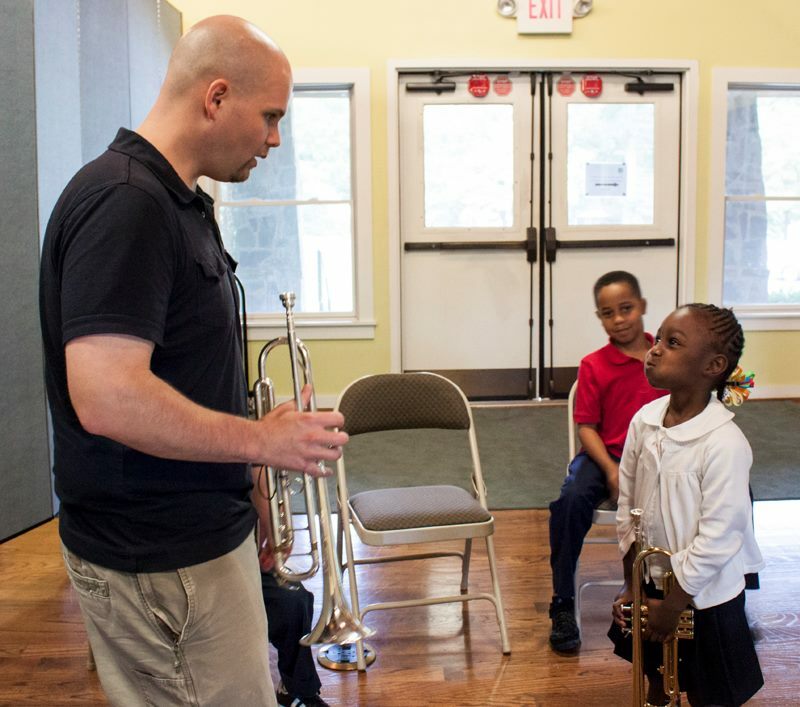 An El Sistema inspired program directed toward at-risk youth in Atlanta’s most underserved communities. I provided music lessons and mentorship using music as a vehicle for social change. 2015, John Driskell Hopkins and The Atlanta Pops Orchestra, In The Spirit. 2012, Mercury Orkestar, Almost Famous... No Awards Yet! 2011, Coy Bowles and The Fellowship, Love Takes Flight on the track Sailing Away 2008, BAS Publishing Company, Promotional Materials. 2008, National Trumpet Competition, Historical Trumpet Division, First PlaceWinner of the Reiche Award and Naumann Award for Artistry on Baroque Trumpet. 2010, University of South Carolina, Masterclass, "Better Music Making"
2010, Georgetown College, Georgetown, KY, Masterclass, "Better Music Making"